A few months ago, Pamela won the top bid on a charity auction item at a local community event – a VIP Pooch Party at P&P. (P&P graciously donated this wonderful prize for charity). Little did Pamela know how lucky she truly was. Pamela and Lu (her pooch host counterpart) have many friends at the dog park, but have never had a party like this before. So she took a chance to host an event for her friends and their dogs. Janene did a marvelous job decorating the gallery into a fun Beach area - fake sand of course, but real grass for peeing! Check out this funny video of the dogs taking turns peeing on the grass. This was our first party where we had so many big dogs. It was a good thing we had 2 grass areas and a lot of room, they loved the open space. 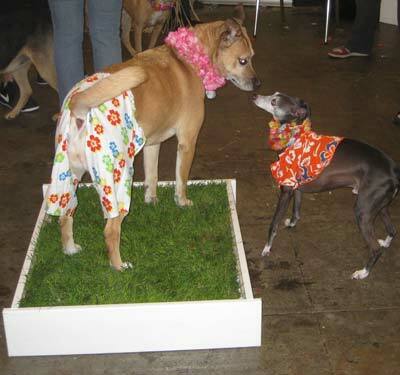 Like other VIP Pooch Parties, Janene hosted the “kibble eating contest” and “best trick contest”. Prizes and cake were enjoyed (and destroyed) by the dogs. The beach balls did not stand a chance. Photo: Lu guarding the Petapotty. However, no one takes her seriously with those crazy shorts on.